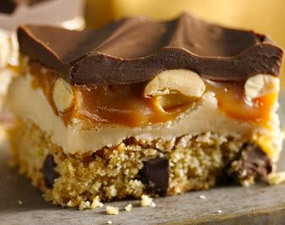 Enjoy these delicious peanut butter cookie candy bars made using Betty Crocker® Gluten Free chocolate chip cookie mix that are perfect for a dessert. 1. Heat oven to 350°F. Make cookie dough as directed on box, using butter, vanilla and egg. In ungreased 13×9-inch pan, press dough evenly. Bake 18 to 20 minutes or until light golden brown. Cool about 30 minutes. 2. In large bowl, beat all filling ingredients except powdered sugar with electric mixer on medium speed until creamy and smooth. Gradually beat in powdered sugar until well blended (filling will be thick). Press filling over cookie base. 3. In medium microwavable bowl, microwave caramels and 2 tablespoons water uncovered on High 2 to 4 minutes, stirring twice, until caramels are melted. Stir in peanuts. Spread evenly over filling. Refrigerate about 15 minutes or until caramel layer is firm. 4. In small microwavable bowl, microwave chocolate chips uncovered on High 1 to 2 minutes, stirring once, until melted. Spread evenly over caramel layer. Refrigerate about 1 hour or until chocolate is set. For bars, cut into 6 rows by 6 rows. Store covered at room temperature.